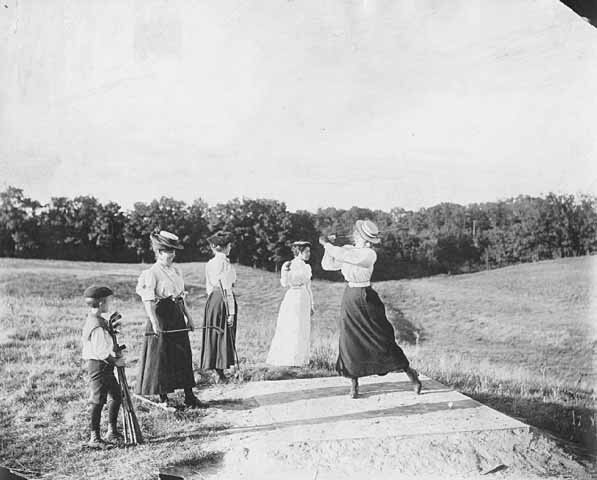 The first golf course in Minneapolis was not Minikahda. 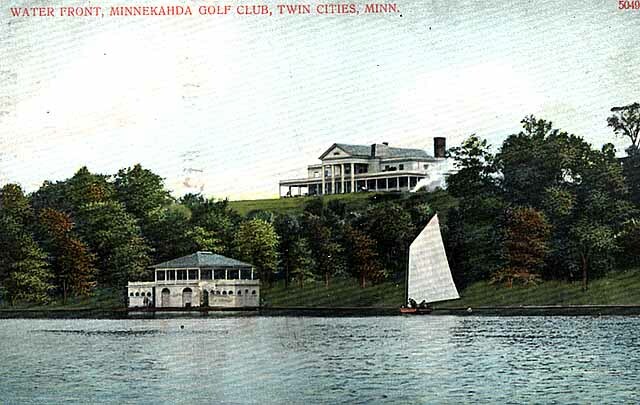 A year before Minikahda opened, many of its members, Minneapolis’s highest society, played at a course much closer to the central city. The first Minneapolis golf course and club were in Bryn Mawr. The course didn’t last long, a little more than 10 years, but it did spawn two of the more famous golf courses in Minnesota: Minikahda and Interlachen. When I discovered Warren Manning’s proposal for a public golf course at The Parade in 1903, I became curious about the first golf played in Minneapolis. I wanted to know what led up to the park board creating the first public golf course at Glenwood (Wirth) Park in 1916. I was surprised to learn about courses, or plans for them, at four locations in the city by 1900. The only one that still exists is Minikahda, which overlooks Lake Calhoun. The first mention I can find of a golf course in Minneapolis — St. Paul already had Town and Country just across the Mississippi River at Lake Street — was in a Minneapolis Tribune article from April 23, 1898, which noted that twenty men who were interested in golf and wanted links closer than Town and Country had met at the West Hotel on Hennepin Avenue for the purpose of forming a Minneapolis golf club. The paper reported, “The grounds proposed are in Bryn Mawr and the high land west, ideal in location and well adapted to links, with sufficient hazards to make the game interesting.” The article also mentioned that the course was advantageously placed near the streetcar line, which ran out Laurel Avenue. Less than two weeks later, the Tribune reported that the Minneapolis Golf Club had been formally organized, the links were almost ready for play, and a greenskeeper—Scottish, of course—had been hired away from the Chicago Golf Club in Wheaton, Illinois. He called the new course the “best inland links he had seen,” according to a Tribune article a few days later. Golf duds at the turn of the century. The nine-hole course measured a bit over 2300 yards with only two holes longer than 300 yards. The first tee was west of the clubhouse and the first green was on the east side of Cedar Lake Road. The second green was across that highway and a small pond. Par for the course, at that time referred to as “bogey,” was set at 45 strokes. That must have seemed an impossible achievement for club members, based on early scores. At the first handicap tourney on the day the clubhouse opened, Martin Hanley beat a field of 40 golfers for the prize of a box of gutta percha balls. His net score was 101. Adding his handicap of 30, he had actually played the course in 131 strokes! That’s not three over par, it’s nearly three times par. The game was young. Hanley remained one of the club’s top golfers after the club moved to Minikahda. It’s worth noting that the most thorough description of the new course and club appeared on May 15, 1898 in the Tribune’s society column, not its sports pages. The list of the first 200-plus members reads like a who’s who of early Minneapolis society: Pillsbury, Peavey, Heffelfinger, Jaffray, Rand, Lowry, Bell, Dunwoody, Christian, Morrison, Koon, Loring. The original plan was to admit 150 men and 100 women as members, but the initial number of female applicants was a bit lower than expected at only 62. The new club had not only a course and greenskeeper, but a club house. The Woodburn residence had been “secured” for that purpose. The clubhouse featured “capacious rooms” and “broad verandas” and was being renovated to provide locker rooms and a restaurant. The location of the clubhouse is indicated by a report in the Saint Paul Globe of July 27, 1898 of a fire at the “quarters of the Bryn Mawr Golf club at the rear of 95 Elm Street.” Elm Street was later renamed Morgan Avenue North. So what was then 95 Elm Street would now likely be in Bryn Mawr Meadows—but that was more than ten years before Bryn Mawr Meadows was a park. The Globe reported that the total loss from the fire was not expected to exceed $200, so it was not likely a factor in the decision of the club to build a new clubhouse in a new—and now famous—location the next year. Over the winter the members of the Bryn Mawr golf club must have become dissatisfied with the course or clubhouse or both, because the membership built a new golf course and a much grander clubhouse near the western shore of Lake Calhoun, the Minikahda Club. The Minikahda clubhouse overlooking Lake Calhoun. 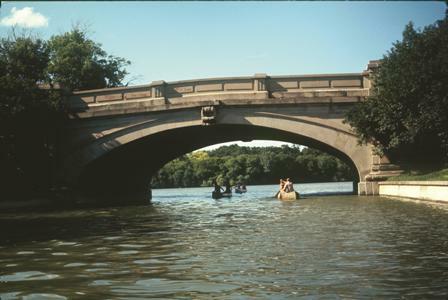 The club’s boathouse was removed several years later when the club and other land owners along Lake Calhoun donated land for a parkway along the shore. That was not the end of the Bryn Mawr golf links, but before it was resurrected another Minneapolis golf course emerged. “The Camden Park golf club has been organized among the young men in the employ of the C. A. Smith Lumber company,” the Minneapolis Tribune reported on July 21, 1899. The new club had a membership of 25 and growing. “It plays over a beautiful course of nine holes laid out in the Camden park region and crosses the creek three times,” wrote the Tribune. The reference must have been to Shingle Creek. As with the Bryn Mawr course, it is not clear that the club owned the land on which it had laid out its holes. Although the Tribune noted that the new club was “particularly fortunate in its course” and that the club “anticipates becoming a large and influential organization some day,” this article is the only mention I can find in Minneapolis newspapers of a golf course in north Minneapolis. A description of the course was included in Harper’s Official Golf Guide published in 1901, with distances and “bogey” for nine holes and the clubs officers. Based on newspaper descriptions of a course that crossed a creek, the course was perhaps laid out on land that became part of Camden (Webber) Park when the park board acquired land for that park in 1908. Next: The Mother of All Minneapolis Golf Courses: Bryn Mawr II. A new Bryn Mawr Golf Club leads to yet another famous club.